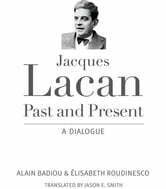 In this dialogue, Alain Badiou shares the clearest, most detailed account to date of his profound indebtedness to Lacanian psychoanalysis. He explains in depth the tools Lacan gave him to navigate the extremes of his other two philosophical "masters," Jean-Paul Sartre and Louis Althusser. Élisabeth Roudinesco supplements Badiou's experience with her own perspective on the troubled landscape of the French analytic world since Lacan's death—critiquing, for example, the link (or lack thereof) between politics and psychoanalysis in Lacan's work. Their exchange reinvigorates how the the work of a pivotal twentieth-century thinker is perceived.